Now for some more creepiness for Halloween, an episode of the classic NBC syndicated series, "The Weird Circle". Program 20 is "The Lifted Veil", based on a story by George Eliot, and concerns eerie premonitions of the future and attempts to bring the dead back to life. 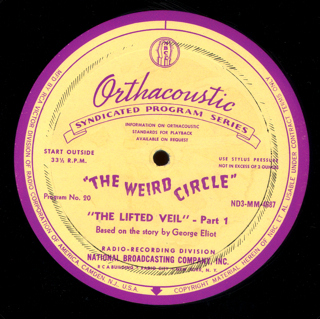 The show was digitized from an original vinyl NBC Orthacoustic Syndicated Program Series vinyl transcription set, ND3-MM-4687-2B and ND3-MM-4688-2. 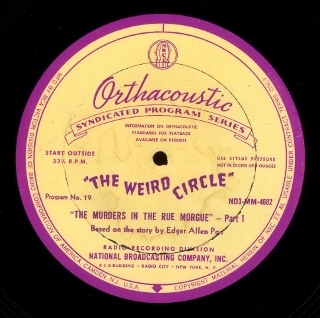 If you're an old time radio collector, you're no doubt familiar with "The Weird Circle", a horror/mystery anthology series based on famous books that was syndicated by NBC in the 1940s. Well, here's your chance to take a gander at one of the labels and listen to an episode dubbed right from an original transcription set for the show. Program 19 in the series is based on Edgar Allen Poe's "Murders in the Rue Morgue". The show was digitized from an original vinyl NBC Orthacoustic Syndicated Program Series vinyl transcription set, matrix numbers ND3-MM-4682-3 and ND3-MM-4683-1. NBC, best known for quality live shows on their network, also offered a wide range of programs especially recorded for syndication to local stations. In some other blog posts, we heard "Playhouse of Favorites", but you might have heard the more famous program "Five Minute Mysteries" (a show I'd like to collect in original transcriptions) or "Weird Circle". McLeod was a busy character actor in radio and television. He was a member of the Frank Benson Shakespeare Company and the the Ben Greet Players in England toured several countries with the Bernard Shaw Players. "The Man With the Story" was, according to an online bio, his entry into American radio. He was so versatile and impressive on the show, that he received many offers for radio and television work through the 1950s and 60s. Here's program 1 in the series, "The Mysterious Drawing", transferred from an original vinyl NBC Orthacoustic Syndicated Program Series transcription, matrix number ND5-MM-11444-3. If you have any other original discs in the series, let me know - I'd love to work on collecting a set. Here's another episode of "Your Playhouse of Favorites", a program syndicated by NBC consisting of dramas based on classic literature. Program 50 in the series, dating from circa 1949-50, is "Enoch Arden", based on the poem by Alfred Lord Tennyson. It's the story of a sailor who leaves his wife behind to earn money and make a better life for them as he travels the high seas; of course, life goes on while he's away. Regrets, heartbreak and much emoting ensue. The program was transferred from an original set of vinyl NBC Radio Recordings transcriptions pressed by RCA, matrix numbers ND6-MM-9219 and ND6-MM-9220-1. "Your Playhouse of Favorites" was one of many series produced especially for syndication by NBC; you might recall others such as "Five Minute Mysteries". The series were offered to stations regardless of network affiliation. Most of these series are well produced and feature the talent heard on the network's programs and "Your Playhouse of Favorites" is no exception. The program adapted classic popular works of literature into half-hour dramas and, although they don't feature "star" names, are excellent examples of the genre. "Robin Hood" is program 49 in the series and dates from about 1949-50. The matrix numbers for the sides are ND6-MM-9170 and ND6-MM-9171-1. You can hear a studio audience at the production - I wonder if these might school or church groups doing a tour of the NBC studios. Continuing from our last post, another five minute Alka Seltzer show featuring the Vass Family. In program 58, the group sings "Crinoline Days" and "Old King Cole". The Vass Family appeared on the National Barn Dance and a few other NBC programs in the late 1930s. According to the announcer, the group hails from South Carolina. In this show, the group sings "Romance Runs in the Family" and "When the White Azealeas Start Blooming" and help out with the Alka Seltzer ads.